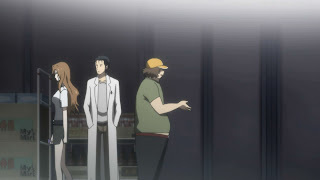 Steins;Gate 06 - Nostalgia Drive!!! 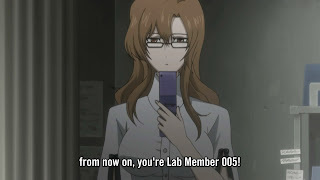 That name was so awesome that they should have stuck with it over D-mail. Anyway, it was another rather slow episode; they seem to be taking their time building a foundation for the story rather than just rushing in. I can't say this is necessarily a good thing; we won't be able to tell until closer to the end. when things start to come together. The problem I see is that, eventually, things will feel boring. For now, though, I'm still pretty drawn in to this anime. 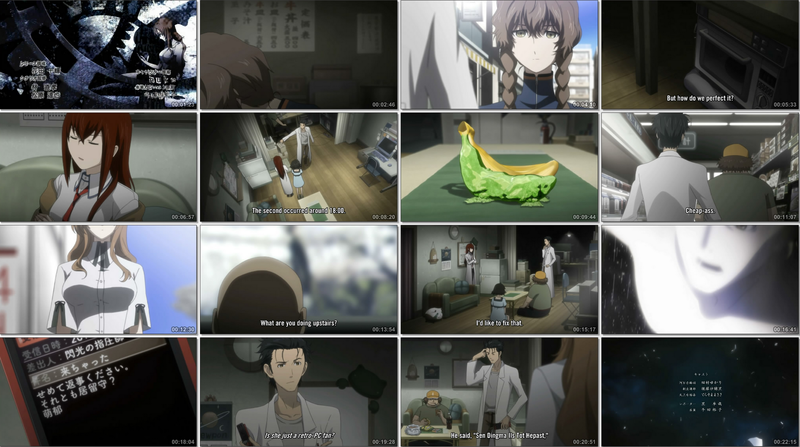 So, another episode carried heavily through Ookarin's dialogue. I guess it is rare to find strong dialogue of just one character that's good enough to carry an anime that's still setting up. 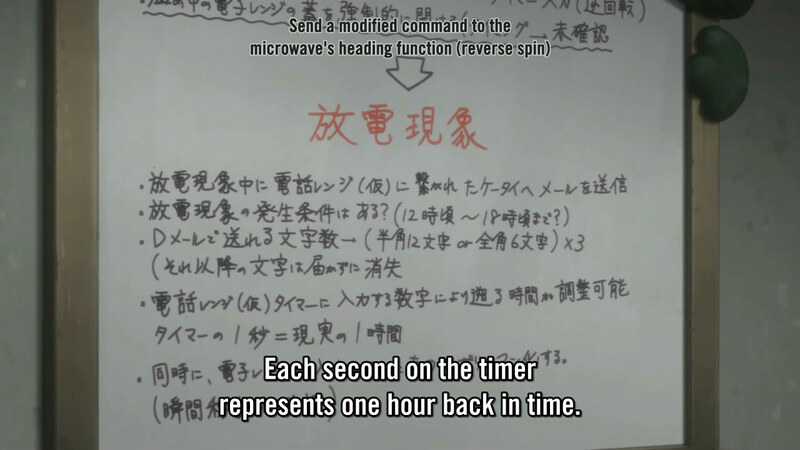 I am one of those people that hate when they need to establish the setting for a long duration of time (things like Higurashi was brutal, since they did it over and over and over again; it just wouldn't end!). Still, Ookarin's insanity and Daru's "thats what she said" hasn't gotten old...yet. It's more of a personal preference, I guess. 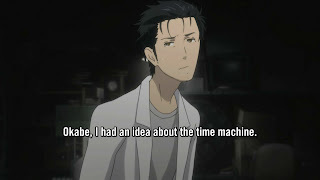 Kurisu helped outline the conditions of their time machine nicely. We got to see the limits of their device, since I doubt it will become much more than what it is now. As the series progresses, we might see more "aggressive" uses of this for Ookarin, particularly to save himself when he is in danger. 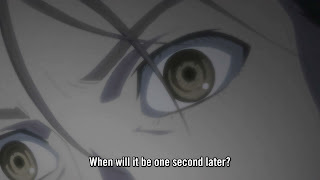 It makes me wonder if it will be a time-skipping anime, where they'll constantly bounce back, or if it'll be just randomly receiving mails to lead him in the right path. I would prefer to see him skipping around rather than following mails to get to the correct route; it would be more interesting to see if they screw up with time travel, I guess. It's another small personal thing. This scene was just poetic. 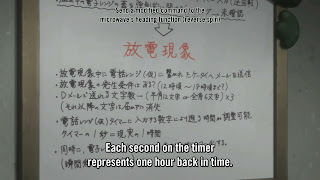 The change of perception of time and space was a very nice touch. I hope they touch more on this subject - preferably when he's time-skipping around. I guess the idea of this change in perspective was something that I'd never thought about. It was more of a revelation for me than anything else. 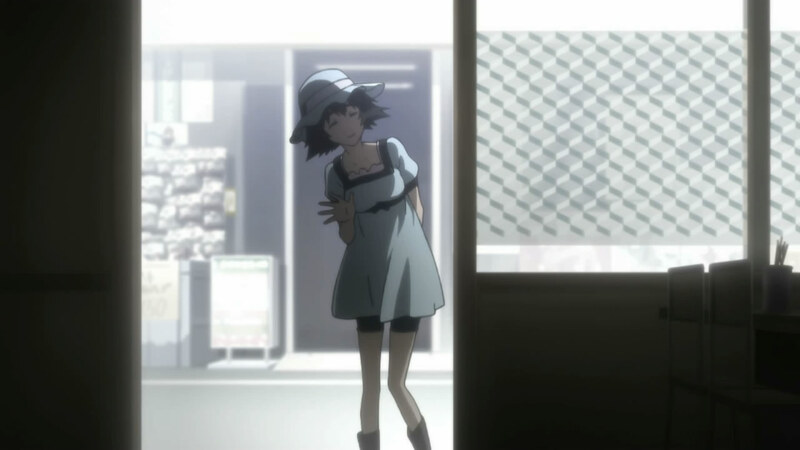 At this point, she still seems like a very minor character. She seems to have some knowledge about events, since she was looking for the IBN too, but what "FB" is will hopefully be revealed soon. 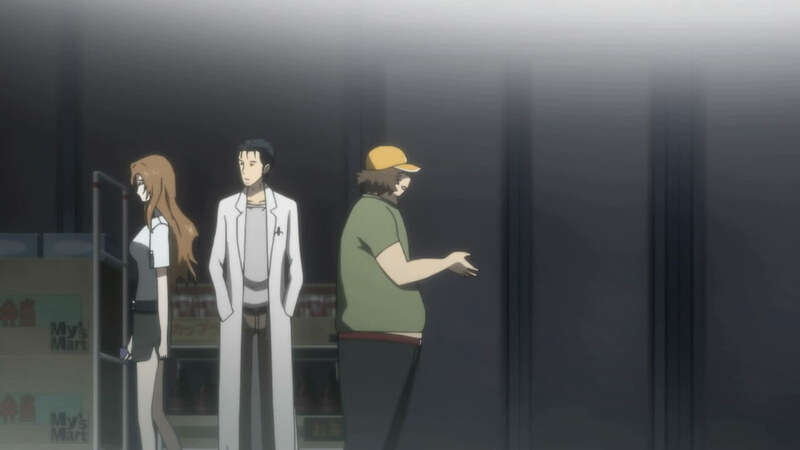 I'm still leaning on my theory that the part-timer is really John Titor, and Kurisu is a secret agent for SERN. It's just my crazy theory, since there hasn't been much of a cliffhanger yet. Everything has been to build up the setting. So, all in all, another setting-building episode. I really hope they start diving deeper into the plot soon. I know they have 24 episodes, so they don't need to rush, but I think it will bore many viewers if they keep doing this for too long. It will change the genre to slice-of-life, at this rate. At least I like the characters that have been introduced and the way they interact. Ookarin's insanity won't get old for me anytime soon.